Traditional data centers use a tiered network topology consisting of switched Ethernet with VLAN tagging. This topology only defines one path to the network, which has traditionally handled north-south data traffic. The transition to a flat, two-tier leaf-spine hyperscale data center network using up to 400G Ethernet links enables virtualized servers to distribute workflows among many virtual machines, creating a faster, more scalable cloud data center environment. Software defined network (SDN) where the control is decoupled from the data path allows a common software stack such as OpenFlow to provide a consistent industry-wide control software environment. Instead of having a proprietary software stack, designers have an OpenFlow managed network, allowing users to provision the networks very easily (virtually), without requiring physical access to the network's hardware devices. Synopsys’ DesignWare interface IP portfolio supporting high-performance protocols such as Ethernet, PCI Express, CCIX, USB, DDR, and HBM, are optimized to help designers meet their high-throughput, low-latency connectivity needs of cloud computing networking applications. 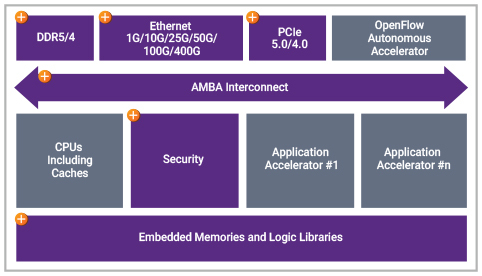 Synopsys’ foundation IP offers configurable embedded memories for performance, power, and area, as well as high-speed logic libraries for all processor cores. high-performance, low-latency PCI Express controllers and PHYs supporting data rates up to 32GT/s to enable real-time data connectivity. NRZ and PAM-4 Ethernet PHYs and configurable controllers compliant with IEEE standards support data rates up to 400G Ethernet to enable high-speed data center networking.